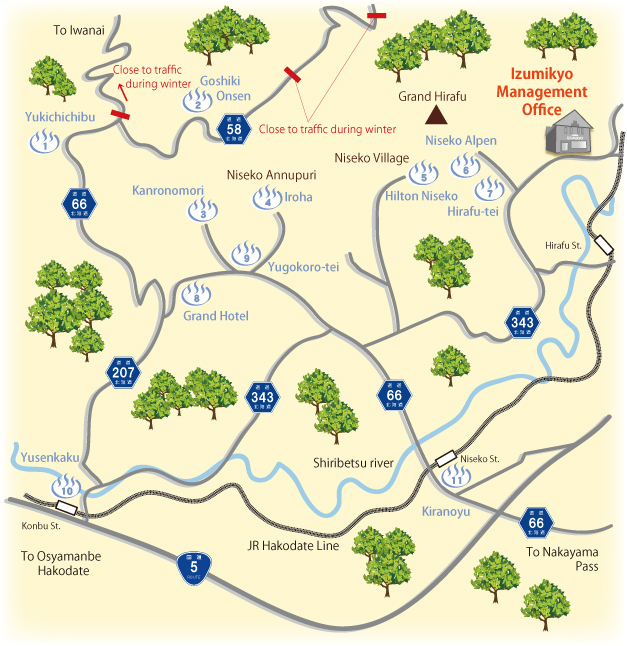 There are numerous ONSEN facilities around the Niseko Izumikyo area. The nearest Onsen is approximately 5 minutes away. The men's and women's baths together come to a total of 11 differently shaped outdoor hot spring baths to be enjoyed. All-wooden, rustic building and facilities; This onsen located in a peaceful and secluded spot.There are a homely and old-country feel to it. Tnis onsen water has many chemicals which help to soothe the skin and relax the muscles.Two different baths can be accessed with one ticket. Kanronomori is all about enjoying yourselves and becoming at one with Nature, leaving the stress of daily life behind you, the 'Mori no Tenku Buro' is the epitomy of indulgence and is the ultimate way to relax and unwind. There are bed baths and sauna too to help refresh a tired body. There are chairs for the bath to make bathing easier and safer for small children and elderly people. There are a large indoor bath and a wide outdoor bath next to a pond with stunning views of Mt. Yotei. This onsen is known for long lasting warmth effect on the body after bathing. Please relax and take your time to enjoy the wonderful nature and beautiful scenery that changes with each season in Niseko. This onsen facility is equipped with sauna, and both indoor and outdoor onsen baths. The hot spring water includes sodium and magnesium and is effective for relieving fatigue and muscle pain. The hot spring will rejuvenate your body after exhausting outdoor activities. The carbon dioxide gas in the hot spring water sinks into your skin and improves the circulation of the blood. That is, the hot spring water is a great stress reliever. This hotel has a open-air bath of mixed bathing, you can happily bathing in the family or group. Soaking in natural hot springs help the body relieve itself from aches and pains. This public onsen has fantastic quality water, which is said to be very good for the skin. This onsen is always popular with locals and visitors alike. Please relax in KIRANOYU Onsen. This onsen have indoor and outdoor hot spring baths for men and women. NOTE) The fees are for day bathing for adults and as of March 2018.